A different twist on the usual mayonnaise based salad. Be sure to use only freshly squeezed lemon juice, not the stuff in the bottle. 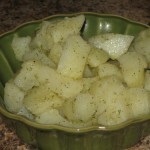 Peel (or, keep skins on if using the small, red potatoes) and dice potatoes into chunks about 1/2-inches then place in a large pot with cold water to cover. Bring to a boil, reduce to simmer and simmer about 12-15 minutes depending upon potatoes – check with a fork. 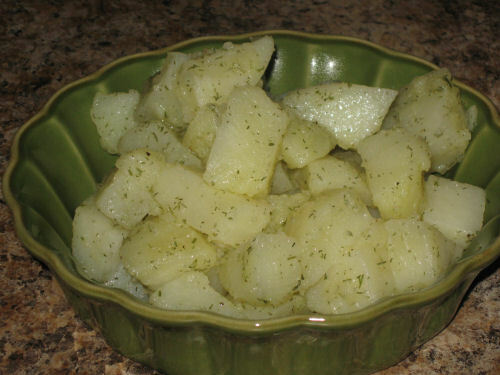 Drain and place in a large bowl; sprinkle the onion powder over the potatoes and mix gently but well. In a small bowl whisk together all the rest of the ingredients then pour over the potatoes, mix gently but well.